A true RARE find is what you have at this residence on the waterfront community of Davis Islands. This BLOCK constructed home perfectly blends style, space and affordability! While the location is fantastic you will be just as impressed with this home’s completely RENOVATED interior, spacious layout and wonderful OUTDOOR spaces. When you first enter the home you will notice the open living/dining room combination that flowing together with beautiful WOOD flooring. The centralized kitchen has been completely renovated with enhanced QUARTZ counter tops, white modern WOOD cabinetry, STAINLESS appliances, raised ceilings, RECESSED lighting and plenty of storage. The kitchen has also been extended into the large family room that has multiple uses and provides access to the backyard through the French doors. The master bedroom is spacious with ON-SUITE bath, his and her closets with BUILT-INs and wood flooring. The on-suite master bath has a MARBLE vanity, wide plank porcelain tile flooring, modern SUBWAY tile and a semi-frameless walk-in shower. The two additional guest rooms are well proportioned, with wood flooring, large closets with built-ins and easy access to the guest bath which has also been FULLY RENOVATED. 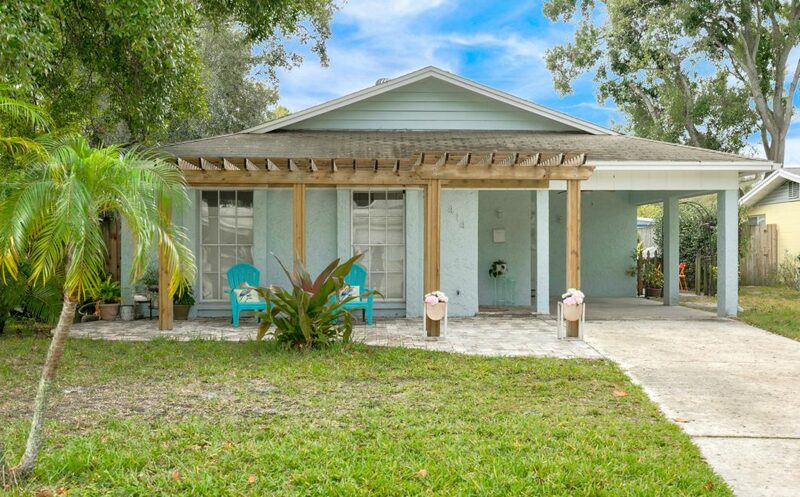 The exterior has an outdoor patio with beautiful pergola for enjoying the Island breezes as well as a fullly fenced yard that is extra deep at 129 ft. Additional updates include NEW A/C (2017), water heater (2015) and update electrical panel (2015). The Davis Islands community has all the amenities you could desire with Marjory Park Marina, Sandra Freedman Tennis Complex, Tampa General Hospital, Historic Roy Jenkins pool, Peter O Knight airport, public boat ramp, dog parks, walking trail and more. You are also conveniently located to downtown Tampa, Channelside District and Hyde Park. Additionally, this home is in the Gorrie Elementary, Wilson Middle School and Plant High School boundaries.